Brittany's Book Rambles: Wildcard ARC Review with Spoilers + Giveaway! Wow, what a turnaround! Between this and The Wicked King this year, I'm just so blown away by how the sequels are making me rethink everything I felt about the series as a whole. I went into Wildcard with extremely low expectations and yet . . . I wanted to know how it was all going to end. Though I'll be honest, I was tempted to wait until some of my friends read this book and then ask them to sum it up for me. But one night, it was just staring at me from my nightstand and I was like oh, what the hell, let's give it a try . . . and I'm so glad that I did. Wildcard somehow made me forget about most of the problems I had with Warcross, such as Emika and Hideo's relationship—where I totally didn't "get" why they liked each other—but in this, I just accepted that they do and was able to finally ship them. I also didn't care about Emika's teammates in Warcross, but Wildcard made me care. The plot was far more intense and even had a few twists that simultaneously caught me off guard and put a dagger in my heart. For those of you who were like me and felt kind of ehhh about Warcross, I definitely recommend giving Wildcard a try. To see just how much I wasn't a fan of Warcross, check out my review! But be warned, if you decide to read past this point, there will be Warcross spoilers. While I actually read this book as an ARC (I know, right? I haven't done that in forever), for my fellow audiobook lovers check out this sound clip. 1) In my review of Warcross, I talked about how Marie Lu included a lot of diverse characters in this story. In Wildcard, Marie Lu continues to let these characters have important roles in the book, which is great. They have a real purpose in the plot, and their backgrounds are brought even more to the forefront of this novel. 2) The characters are so much more fleshed out. I didn't care about any of Emika's teammates in Warcross, but Wildcard made me care. Their personalities and quirks are explored further, and Marie Lu shows off more of their backstory. In fact, my new favorite character is Jax. Can Jax have her own book, please? It's not often that I am just as attached to characters introduced in sequels as I am to the original characters, but when it does happen, I usually fall hard and that was the case with Jax. 3) Zero's backstory. To me, he is the most interesting character in this series overall. And in Wildcard, we find out exactly what happened with him, what he's been up to. I especially enjoyed Zero and Jax's story, which was so heart-wrenching. We just get little nuggets of what their lives were like but it's still so swoony and tragic. I would kill for a novella about those two. 4) Hideo and Zero. I am such sucker for brothers. These two have such a beautiful, twisted, and tragic relationship that just thinking about it makes me emotional. 5) The plot in Wildcard is so much more action-packed and absolutely not predictable—unlike Warcross. I literally could not put this book down. 6) You know how you watch a movie or read a book, and somehow no one gets arrested for the things they do? Well this book actually depicts the consequences for breaking the law as well as how rich people still often get the easy way out. I don't want to go into too many details about this because of spoilers BUT let's just say that it's rare to see actual due process be carried out in books. Usually, the characters can commit murder, theft, etc etc and get off scot-free. 1) While I accepted that Emika and Hideo are a couple . . . "just because", I still wish I understood their feelings for each other more. I appreciated that we got to see them struggle through the obstacles of their relationship more in this book, but it wasn't enough for me to fully understand their attraction for one another. For the most part though, I was able to look past that, accept that they were the ship, and even root for them. 2) I felt that the ending was a tad rushed. Given an additional 50 pages or so, I feel that this story could have been wrapped up a bit better. As it stands, the ending is a bit of a whirlwind, and while that may be intentional because of how action-packed this story is, it could have been even more amazing with more time and space. 3) There are news clips at the end of the book so the reader knows how Emika and Hideo are doing, and I found it to be. . . easy, somehow. Maybe if there was a date on it (hopefully there will be in the finished copy? ), then I would feel differently about it. I don't mean to be cryptic but I'm trying really hard not to spoil much! I refuse to believe that he's nothing more than a monster. I can't watch him sink like this. I keep going because I need to find that boy again, the beating heart buried underneath his lie. I have to stop him in order to save him. You are forever a piece of my story. I couldn't turn my back on you without turning my back on myself. I know he's better than me in every way. But I'm thinking that, even though there's no one in my family willing to wait around for me, even though you're the only one in here, I couldn't care less, because you might as well be the entire damn world. See, here's the moment after my speech when I'd like to either go right up to you or leave the room in a grand finale, except I'm kind of tied down to this stupid bed, so now it's just awkward. I loved this book! I'm really glad that Emika and Hideo turned out the way that they did, especially since Warcross/Wildcard only takes place over the span of a few months. It would be a little unbelievable if they were true loves forever after that short of a time period (although I did kinda know that I would marry my husband after a couple of months... but that's another story... and I'm also putting it into a YA novel/novella because it was kinda crazy and weird). I really loved Hideo and Zero too. I bawled for pages when I read chapter 31. I can't believe I still need to read (and buy xD) Warcross. When it first came out I wanted to get it but you know... so many books, so little time. I'm glad to hear this was good! I liked Warcross but I didn't really feel Emika and Hideo either- glad I wasn't the only one!- so I'm really anxious to see where their relationship goes here! Plus Emika's teammates- I definitely want to see more of them developed. Thanks for a great review- I want to read this even more now! I like how you set out this review! Very informative to read. I'm so glad to hear this turned out to be such a great read for you. I just got my copy in the mail last week so I'm more excited than ever to start reading. You have almost convinced me. 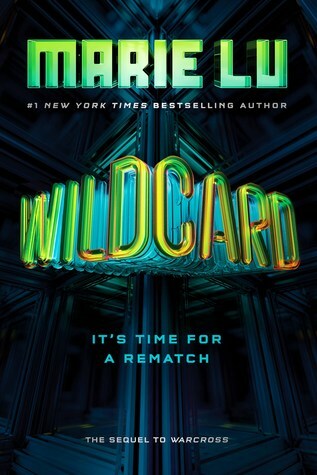 I am not really a fan of tech-y books or gaming books, so the romance in Wildcard was my only hope and it was so not my thing. I had high hopes for a triangle (something I almost never say). I peeked at the ending of this and.... nope. I'm sad but I think I have to skip this. This looks like a good book and thanks for your review of it. The story line sounds interesting! I skimmed this review since you said it contained spoilers! I recently borrowed the audiobook for Warcross from my library. I was going to start it soon -- sooo many people love it. Aw too bad I missed the contest as I do have this book (and the first) on my wishlist. So glad you enjoyed it and I'm going to make sure I read in order.